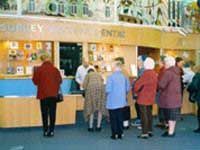 Surrey History Centre has been designed to provide the best possible conditions for preservation and public access, and also to be a focus for promoting awareness and understanding of Surrey's history. Surrey History Centre replaced the Surrey Record Office, the Guildford Muniment Room and the Surrey Local Studies Library. Surrey County Council found £3.75 million and provided the site. A successful Heritage Lottery Fund application added £2.74 million. Surrey History Centre is now the home of Surrey Heritage. The designers were WS Atkins Consultants Ltd, who have their head office in Epsom. WS Atkins have a wide range of experience in designing buildings and engineering systems associated with document conservation. Both the Architect and Engineer on the project sit on the British Standard committee responsible for BS5454: recommendations for storage and exhibition of archival documents. The survival of historic documents is dependent upon the environmental conditions in which they are kept. If the air is too dry they can become brittle and ink can separate from the paper or parchment. If it is damp and warm there can be mould growth which can permanently damage or completely destroy documents. In addition there are risks from gaseous pollutants in the atmosphere, infestation by rodents and insects, fire and water. Security must also be maintained. The Surrey History Centre repository employs a very heavy weight structure which is insulated on the outside. This provides a 'ballast' against outdoor conditions, and reduces reliance upon the air conditioning system. The strong rooms have four-hour fire protection and an Argonite (inert gas) fire suppression system. The building incorporates a ventilated sunshade to protect the roof of the repository. The contractor was the MJ Gleeson Group. The building is long and relatively narrow. The public areas face onto Goldsworth Road, the strong rooms are in the centre, and the acquisition, cataloguing and conservation rooms are at the rear. In the foyer, the striking Surrey tapestry extends along the upper part of the rear wall. Designed by Philip Sanderson and woven by Philip and five colleagues at the West Dean Tapestry Studio, the tapestry depicts the history of Surrey from Roman times to the present day. At the front of the foyer is Surrey in glass, two large engraved glass panels by Martin Donlin, interweaving historical and archaeological subjects with text. These artworks were funded by the Arts Lottery Fund. The foyer has a help desk with a bookstall, cloakroom and small refreshments area. The Centre has a large conference room which can be divided into two using an acoustic screen. Most of our heritage events take place here. The "Heather D Hawker Room" is fitted with glass fronted bookcases giving access to books, journals and pamphlets on all aspects of the history of Surrey. The main series of Ordnance Survey maps are also kept in this room. Archives and other rare and valuable material can be ordered from the strong rooms. There is seating and table space for 24 researchers, including large tables for the consultation of maps. Because the room faces north, researchers can enjoy good natural light without the glare and heat of direct sunlight. There are microform readers, and these are positioned on the side of the room furthest from the windows.